This picturesque and unusual name is of Anglo-Saxon or Old Norse origin, and is a good example of that large group of early European surnames created from the habitual use of nicknames. These were given in the first instance with reference to a variety of characteristics, such as physical attributes or peculiarities, mental and moral characteristics, supposed resemblance to an animal's or bird's appearance or disposition, habits of dress, and occupation. 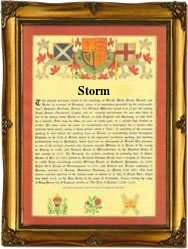 In this case the surname "Storm" was given to someone with a blustery, "Stormy", temperament. The name derives from the Old English pre 7th Century "storm", or Old Norse "stormr", storm. a similar nickname that has survived as a modern surname is "Tempest", as in Roger Tempeste (1168, Yorkshire). The are two patronymic forms of the name Storm, found as Storms and Stormes, and indicating "son of Storm". One Amy Stormes was married to James Gregory at St. Dunstan's, Stepney, in London, on January 28th 1571. The first recorded spelling of the family name is shown to be that of William Storm, which was dated 1206, The Norfolk Curia Rolls, during the reign of King John, known as "Lackland", 1199 - 1216. Surnames became necessary when governments introduced personal taxation. In England this was known as Poll Tax. Throughout the centuries, surnames in every country have continued to "develop" often leading to astonishing variants of the original spelling.